In today’s geographically-dispersed global marketplace, keeping your employees informed and educated about products, services, and ways to improve their skills can be a howling headache. So many organizations are turning to technologies such as Web-­based training, virtual classroom sessions, or social media to get the word out … and finding disastrous – or sometimes no – results! What if your employees HATE taking online learning? What if, while they like computers, they can’t spell “PC” and thus can’t effectively maneuver through your Web-based course? As a learning leader in your company, don’t you want to know this? Then “fetch” the Regan Computer Competence, Attitude, and Behavior Survey. 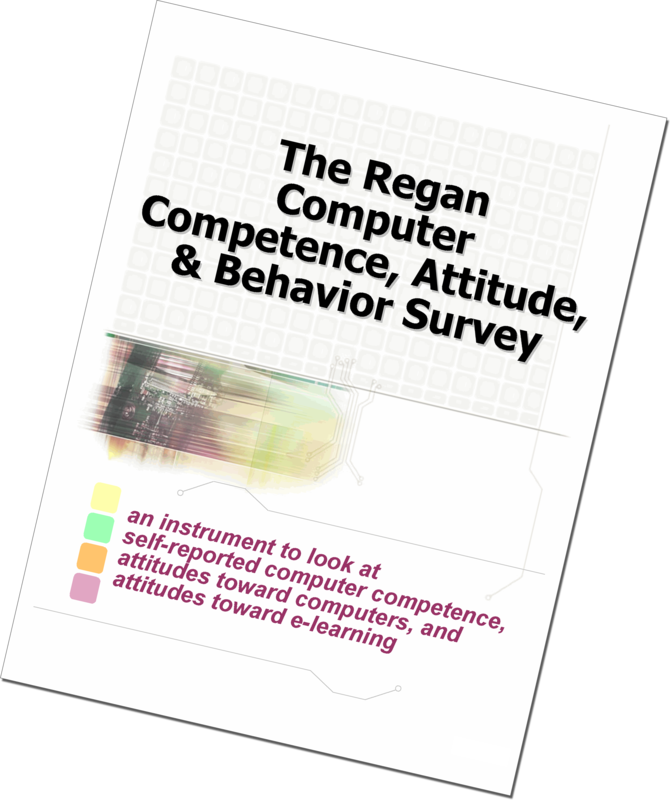 The Regan CCABS measures your employees attitudes toward technology, attitudes toward e-­learning, and self-­reported computer competence. Why should you care? Because the effort (and expense) for incorporating e-­learning at your company could be undermined if your employees have a bad attitude toward your “e” efforts, or if their PC skills are lower than need to complete your e-­learning. What if you find out the majority of your employees are “eLearning Foes”? Take action to improve their attitudes before rolling out your next “e” initiative. Have a heap of “Computer Novices”? Determine some remediation to offer them to get their skills up before throwing them into a virtual classroom. Take the guessing out as to why no one is coming to your “e”. Email us and request your FREE* copy of the Regan CCABS today. You’ll be doggone glad you did. * Why “free”? Well after you use the Regan CCABS all we’ll ask you to share is your data. No: we don’t want personal info just the “raw” data scores that shows how people scored on the instrument. Why? Because we’re nerds … and we’re accumulating a database of the outcome of the instrument so we can look for fun trends and share with others. Fun stuff, huh? PS: Interested in the validity and reliability of the Regan CCABS? Click here.